With the recently launched Palestinian-Israeli peace talks receding into a state of limbo and while Yemen is slowly disappearing from headlines a smaller stories from the Middle East are going on in the marginals of western mainstream media. However these some times crueler actions may change situation on the ground even more than high level official diplomacy. News from peace talks too often are limited to photo opportunity to see negotiators and host making theatrical handshake – of course studying the outcome of talks one has some base to claim that this staging indeed was the (only) content of meeting. However outside cabinets in theatre of operations actions are following one another although they are not dominating front pages of mainstream media. Here I have collected some fragments of information flow from first part of November. Missile struck Al Qaeda operative's car in Gaza, made by U.S.
Lawyers for the Barack Obama administration told a federal judge Monday that the U.S. government has authority to kill U.S. citizens whom the executive branch has unilaterally determined pose a threat to national security. That claim came in federal court in Washington, D.C. in response to a lawsuit brought by the American Civil Liberties Union (ACLU) and the Center for Constitutional Rights (CCR). The two human rights legal advocacy organisations contend that the administration’s so-called “targeted killing authority” violates the constitution and international law. The ACLU and the CCR were retained by Nasser Al-Aulaqi to bring a lawsuit in connection with the government’s decision to authorise the targeted killing of his son, Anwar Al- Aulaqi. (Source: Obama Lawyers Defend “Kill Lists” By William Fisher). Targetted killing of Anwar al-Aulaqi is coming easier now. In the first week of November, directly after the discovery of two explosive parcels mailed from Yemen to the United States, Washington moved a squadron of Predator drones to a secret base at the Yemeni Red Sea port of Al Hodaydah. Until now, the covert facility – finished in April on a site CIA director Leon Panetta has selected last January – was allotted to US Joint Special Operations Command (JSOC) units for mounting clandestine raids against Al Qaeda cells deep inside Yemen. Yemen has so far claimed that the war on Al Qaeda is carried out exclusively by the Yemeni army, however for some time now, US warplanes and drones have been crisscrossing Yemeni skies from their bases in Djibouti and the decks of aircraft carriers offshore. Officials in Sanaa have habitually claimed those sorties were the work of the Yemeni air force, although it has neither the aircraft nor the air crews able to conduct these precision attacks. DEBKAfile‘s Middle East sources note that it is the first time in seven years that US air strike forces are stationed on Arabian Peninsula soil. In 2003, the American Air force dismantled its Saudi base and withdrew to Qatar and Oman. At a special White House security consultation last week, Obama said it was time to plant America’s military option against the Iranian nuclear threat visibly and tangibly under the noses of Iran’s political and military decision-makers. In the last few days, three aircraft carriers, four nuclear submarines and marine assault units have piled up opposite Iranian shores. Early Sunday, the influential Senator Lindsey Graham (R. South Carolina), member of the Armed Services and Homeland Defense committees, said: “The US should consider sinking the Iranian navy, destroying its air force and delivering a decisive blow to the Revolutionary Guards.”As part of this strategy, two weeks ago, the White House requested the heads of NATO to draw up operational plans for attacking Iran’s nuclear and military facilities. A further round of conciliation talks between PLO/Fatah and Hamas broke up in Damascus Wednesday, Nov. 10, without accord. The Fatah delegation insisted that the Palestinian Authority headed by Mahmoud Abbas be the sole sovereign authority for all security services in both territories, Hamas didn’t agree. This dispute will decisively influence the US-sponsored talks between Israel and the Palestinians – if they ever take off. It means that the only accommodation attainable would be, at best, a partial one covering only the West Bank. Same time the Hamas government’s deputy foreign minister Dr. Ahmed Yousef is actively campaigning for the Gaza regime to form a strategic partnership with Iran on the same lines as the Iranian-Syrian-Hizballah alliance. He also invited Iranian President Mahmoud Ahmadinejad to visit Gaza. Close ties between Gaza and Tehran will bolster the Palestinian extremists’ military and intelligence ties with Damascus and Hizballah. This will in turn boost the bloc led by Iran and Syria and add to its leverage for derailing any fence-building moves between the feuding Hamas and Mahmoud Abbas’s Fatah and perpetuate the division between the two Palestinian entities – one in Gaza and the other on the West Bank. This stronger alliance may also threaten the stability of Jordan, where already Hamas-Damascus controls the local Muslim Brotherhood branch. Will Negotiation Slot for Kosovo be used? When UN made new Kosovo related decision on September 2010 it was believed that resolution would enable a dialogue for resolving this frozen conflict. With minimal preconditions new direct talks between Belgrad and Pristina and a possible deal between local stakeholders could open the way for sustainable solution. However resent events have have resulted in stalemate: President of separatist Kosovo government resigned and dissolution of the government itself have put the focus in Kosovo on next elections which will be held in December 2010. Meanwhile also Serbia starts soon preparations for its next next elections, due by spring 2012. Thus there is a narrow negotiation slot between the time when a new Kosovo government takes office and to end successfully before the Serbian election campaign makes any compromise impossible. The core question is if there is political will to start talks with the aim of reaching as comprehensive a compromise settlement as possible. Serbs and Albanians have been in negotiations and talks half a dozen times over the past two decades – from the tentative efforts of the 1990s to the doomed talks in Rambouillet, France, in 1999 and the later “status” talks between 2005 (Ahtisaari’s pseudo-talks) and 2007 (“Troika” led talks). None of these has led to tangible results and left outsiders imposing an outcome, be it NATO intervention or proposing the Ahtisaari plan. The original or better to say official aim of international community was to build “standards before status”, on 2005 the task was seen impossible so the slogan changed to “standards and status”. Even this was unrealistic so Feb. 2008 “European”standards were thrown away to garbage and “status without standards” precipitately accepted by western powers. For international community I don’t see any success story with this backward progress. Thus the multi-ethnic idea is far away despite EU’s billions. The remaining Serbs in Kosovo are barricaded into enclaves keeping their lives mainly with help of international KFOR troops or in de facto separated Serb majority region in North Kosovo. This has changed former multi-ethnic province more mono-ethnic one. The new situation has forced also International Crisis Group (ICG) to admit the defeat of its Kosovo policy recommendations during last decade. ICG has acted as informal extension of U.S. State Department however pretending to be neutral mediator and think tank. During earlier “status” negotiations 2005 it endorsed preconditions before talks and afterwards supported sc Ahtisaari plan. Now in their new analysis ”Kosovo and Serbia after the ICJ Opinion” ICG sees Kosovo’s partition with land swap one of possible solutions during coming talks between Belgrad and Pristina. ICG notes that Pristina will not accept partition but gives some hints it might consider trading the heavily Serb North for the largely Albanian-populated parts of the Preševo Valley in southern Serbia. The (dead) Ahtisaari plan and expanded autonomy for North Kosovo are the other two conceivable solutions according ICG. The fact on the ground is that northern part of Kosovo is integrated to Serbia like it always has been, as well those parts south of Ibar river, which are not ethnically cleansed by Kosovo Albanians. Serbia still runs municipalities, courts, police, customs and public services, and the EU Rule of Law Mission (EULEX) has been unable to deploy more than a token presence there. Besides the status, autonomy degree of Northern Kosovo (or its also formal integration with Serbia) the third key question during planned talks is the security of the Serbian Orthodox Church’s most venerable monasteries and churches. The Church, fearful of a repeat of the March 2004 mob violence that left many religious sites in smoking ruins, wants more than extensive protection promised in the Ahtisaari plan; extra-territoriality, treaty guarantees and protection by an international force after NATO-led peacekeepers (KFOR) leave could be solution. However question of returns seems not be in priority list any more. During Nato bombings some 200.000 Serbs and some thousands of Roma were expelled from there to northern Serb-dominated part of province or to Serbia and due the security problems or economical reasons they have not returned or are not even planing to come back to their (destroyed) homes. I have my – not so well-disposed – opinion about Mr. Ahtisaari and his negotiation skills related to Kosovo. Instead repairing his earlier mistakes EU in my opinion should start to distance itself from U.S. cowboy policy. Now many Europeans realize they were hoodwinked into recognizing Kosovo’s independence on the pretence it would resolve problems and bring peace – it didn’t happen; a new approach is needed. Would Serbia be prepared to trade sovereignty over Kosovo for membership of the EU? Not according to a Gallup poll in which 70% opposed the suggestion that Serbia relinquish its claim over its southern province in return for joining the EU. About the same proportion felt that Kosovo ‘has to remain a part of Serbia’ and said that Serbia would never recognise Kosovo. At the same time, a relative majority of 43% seemed resigned to accept that Kosovo would be independent one day, regardless of what Serbia did to prevent it. In other poll a total of 74.5 percent Kosovo Albanians supported the idea of forming a single state which would be inhabited by ethnic Albanians, and 47.3 percent believe this ambition would be realized soon. Albanians today also live in north-western Greece , western Macedonia , southern Serbia and southern Montenegro. From other side Kosovo cannot even begin the EU accession process because five EU member states do not recognise its independence. A Gallup survey revealed growing disillusion with the new status among those who had been so hopeful. 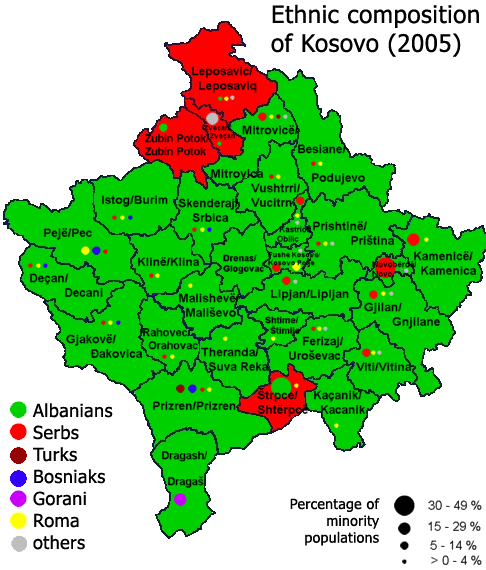 When Kosovo declared its independence from Serbia in February 2008 there was great optimism among the territory’s ethnic Albanians, if not among ethnic Serbs. Although three-quarters of Kosovo Albanians said they felt independence had been a good thing, this was considerably fewer than the 93% who had greeted the unilateral declaration of independence in 2008. Ethnic Serbs, meanwhile, became yet more convinced that independence had been a mistake: 80% said it was a ‘bad thing’ in 2009, compared to 74% a year earlier. Despite being less positive in 2009 that Kosovo’s independence was a good thing, almost half (48%) of Kosovo Albanians said things in the country were going in a good direction. Hardly any Kosovo Serbs agreed that the country was going in a good direction (2% vs. 86% who disagreed). In Kosovo, meanwhile, the International Civilian Representative and EU Special Representative has a thankless task: neither of the territory’s two largest ethnic groups is convinced of the benefits of an international presence. In the 2009 Gallup poll more ethnic Serbs and ethnic Albanians saw no need for an International Civilian Representative/EU Special Representative, rather than thought it necessary. A considerable number of ethnic Albanians nevertheless expressed support for the work being done by the EULEX mission for maintaining stability and security in the disputed territory. Kosovo Serbs, by contrast, were dismissive of its role. The international community should facilitate as complete a settlement as is possible, leaving it up to the parties themselves to decide how far and in what direction they can go to achieve sustainable compromise. According ICG “The most controversial outcome that might emerge from negotiations would be a Northern Kosovo-Preševo Valley swap in the context of mutual recognition and settlement of all other major issues”. As I have propagated this outcome as pragmatic solution for years I have nothing against to this result, at least it with nearly all aspects is better than situation today and prospects for future. On the other hand stagnation with Kosovo case paralyses regional progress too. A slight risk – according some international observers – may be that border changes could provoke mass migration by Kosovo Serbs now living south of the Ibar, as well as destabilizing separatism in neighboring Macedonia and Bosnia-Herzegovina. However from my viewpoint migration from enclaves is already ongoing, Macedonia has developed practice to copy with separatism and Bosnia is destabilising due internal reasons without outside help. Officially (UNSC resolution1244) Kosovo is international protectorate administrated by UN Kosovo mission, practically it is today a pseudo-state with good change to become next “failed” or “captured” state. This time (hopefully and finally) real talks between local stakeholders with unpredicted but possible compromise can end this frozen conflict, but “negotiation slot” is time-wise narrow and should be started to use this winter. Failure to negotiate in the next months would probably freeze the conflict for several years, as the parties entered electoral cycles, during which the dispute would likely be used to mobilize nationalist opinion and deflect criticism of domestic corruption and government failures. You are currently browsing the Conflicts by Ari Rusila blog archives for November, 2010.